Having just celebrated a birthday and the release of a movie, the debut of Janet Jackson‘s super-short crop suggests she’s all about fresh beginnings this year. Chopping off her long, wavy locks for a newly popular pixie cut, Janet’s just the latest celeb we can add to the list as proof that almost anyone can pull of rocker-chic short hair. This slimming hairstyle opens up her face and draws attention to her delicate bone structure, pulling our gaze to her big brown eyes. And just like Hayden Panettiere and Renée Zellweger before her, Janet proves that longer doesn’t always equal better. 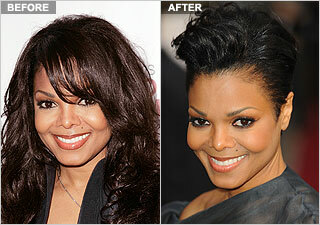 What do you think of Janet’s new low-maintenace style?